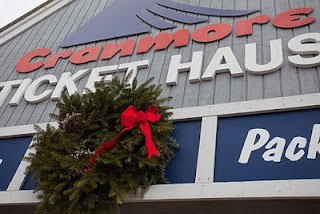 Happy holidays from your friends at Cranmore! This will be the place for families this Christmas vacation week with a variety of fun events and activities, ranging from its second annual New Year's Eve event, a terrain park competition, live family entertainers, fireworks, night skiing, snow tubing and more.New Year's Eve at Cranmore will give families a fun and early night of festivities with fireworks at 7:30pm, and skiing and riding until 8pm. In addition to fireworks, Cranmore will also offer a fire dancer performance at 5-7pm. Their Arctic Blast Tubing Park will slide away until 9pm New Year's Eve and every night during vacation week.Popular Celtic crooners Dennis and Davey are featured live music in Zip's Pub from 4-7:30pm on the 31st. The same afternoon, children's entertainer Marcus Gale will wow the little ones in the Eating House stage from 3:30-4:30. Both acts are free and open to the public. Cranmore's indoor "Fun Zone" offers kids indoor action with a giant inflatable bouncy house, 65-foot two-person obstacle course and games including tennis, floor hockey and basketball. New for this year is the addition of the Euro-Bungy Mega Trampoline which lets kids and adult bounce, jump and flip. The Fun Zone also enhanced its pre-schooler options with an enlarged and improved toddler play area and a smaller bouncy house sized for younger children.The Fun Zone opens Saturday nights and holiday weeks throughout the winter season from 3-8pm. Christmas Vacation week, the Fun Zone opens December 26, 2009 - January 3, 2010. A variety of ticket packages are available ranging from $12 for just the Fun Zone to $26 for a Mega Fun Zone ticket which also includes the Euro-Bungy and 1 trip up the indoor climbing wall. A Super Slider ticket offers snow tubing, night skiing plus Fun Zone admission for $49. Cranapalooza will light the skies with night skiing and fun activities on Dec. 26 and Jan. 2 in addition to New Year's Eve. Cranapalooza is Cranmore's Saturday night festival where children can make s'mores with Cranmore's penguin mascot, get their face painted and get free goodies and prizes while playing games with C-more. Live music and children's entertainment also takes place every Saturday night. Not to leave out older kids, teens and others who love to shred, Cranmore's Darkside Terrain Park will serve up the first terrain park event of the year, the Monster Mash. The Monster Mash rail jam competition takes place in the Darkside Terrain Park on December 27. The Monster Mash is sponsored by Eastern Boarder.